What was wrong with 3.5mm audio jacks? They have been standard for many years, they worked reliably, and you could find tons of headphones that supported them. But no, companies have to sometimes invent reasons to change things around and here we are with the 3.5mm jack mysteriously disappearing from modern smartphones to be replaced by USB-C digital audio. Yes, I know that size constraints matter, but so far, the released phones with no jack don't make a good case for that argument and don't provide any new hardware that uses the additional empty space favorably. And for the record, I am ranting even though I use Bluetooth headsets 99% of the time; I just like having the 3.5mm plug option for that 1%. Anyway, now we have to endure phones that don't have a 3.5mm jack and instead come with digital headsets, which are more expensive, rarer to find, provide less choice, and are divided into USB-C for Android users and Lightning for iOS users — God forbids we keep one standard that everyone uses! And for those who are still clinging onto their 3.5mm headsets, there's a dongle or adapter to carry around and worry about losing, so you can plug your old school gear into your fresh new phones. HTC provides that adapter cable for the HTC Bolt and will likely do the same for the HTC U, because some of U might need it. How thoughtful. Even more thoughtful? They have an app to update the firmware of said adapter. Yes, yes, yes, I know that's cool. 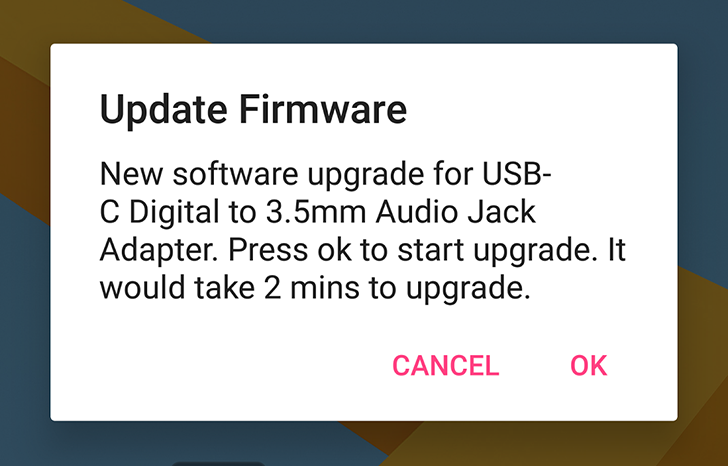 It'll keep it up to date and likely deliver audio improvements over time, because we're talking digital audio now, but why the heck are we updating the firmware of an unnecessary adapter in the first place? This just feels like a solution to a problem no one asked for. If you're still reading, you might want to know that the app is free and will likely only install on HTC devices with no 3.5mm jack who need this kind of adapter.